My website has now been refreshed and updated with the addition of several new sculptural images and I have made a real commitment to keep it current with quarterly updates to this section. Have a look at the new gallery page! Three small sculptures of a black bear, walrus and frog all mounted on native rock. New works in progress include a new octopus sculpture, smaller than the previous sculptures. I expect to have this piece in bronze by late October. The orangutang sculpture is nearing completion and I hope to have it cast in bronze by the early new year. Other pieces include a desk lamp with a cast abalone shell mounted on a cut river cobble and a wall mounted octopus sculpture. In a departure from my regular work, I am embarking on a new stylized sculpture using the female form. Several of my works are now on display up at Nimmo Bay Resort, at the Shell Aero Centre at the Victoria International Airport and at the Pier Hotel in Sidney BC. I will be entering 2 to 3 pieces in the Sidney Fine Art Show this September and will once again be part of the Saanich Peninsula Art Studio Tour on October 21 and 22, 2011. Two new life sized bald eagle sculptures and a small killer whale. New sculptures of an Oyster Catcher and the Tufted Puffin. 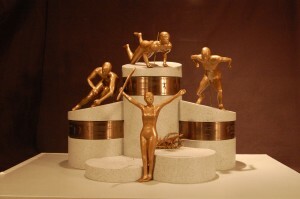 A major focus for much of 2010 was the design and submission of “Keeping the Inspiration Alive”, an Olympic Legacy Project for the Resort Municipality of Whistler. This project was a joint effort by Nathan Scott and myself. We were shortlisted for the final phase of the project for which we built a very elaborate scale maquette of our proposal. We came very, very close to winning but missed the “Gold”. This was an extremely exciting and motivating experience. With the new year comes a new wave of energy and inspiration. I am currently finishing up two life sized commissioned sculptures of a departed Chocolate Labrador and a Timber Wolf and expect to have them in bronze by the end of March. Other works now in progress include a new octopus sculpture and a great blue heron. Following on with the canine theme I am planning on two more dog sculptures this year, one of a British Bulldog and the other of a Beagle. These pieces will contribute to my upcoming “Dog Show” in December. I am very excited about my next project which will see two new life sized sculptures of Orangutangs in bronze sometime this summer. Soon my web site will be updated and revised to include several new works. Several selected works will again be on display up at Nimmo Bay Wilderness Resort. Works will also be on display in the reception lounge located in the Shell Aero Centre at the Victoria International Airport and at the Pier Hotel in Sidney BC.